This market leader is renowned among breeders of all types and combines all the advantages of a traditional oat-based mix with a scientific formulation which delivers optimum nutritional support to all breeding and youngstock. Only the best quality oats are included making the mix nutrient dense and particularly appetising, so ideal for tempting fussy feeders. It contains excellent quality protein for muscle and tissue development and repair whilst the superior vitamin and mineral profile has been specially developed to support growth and includes chelated (Bioplex ®) minerals and important antioxidants. 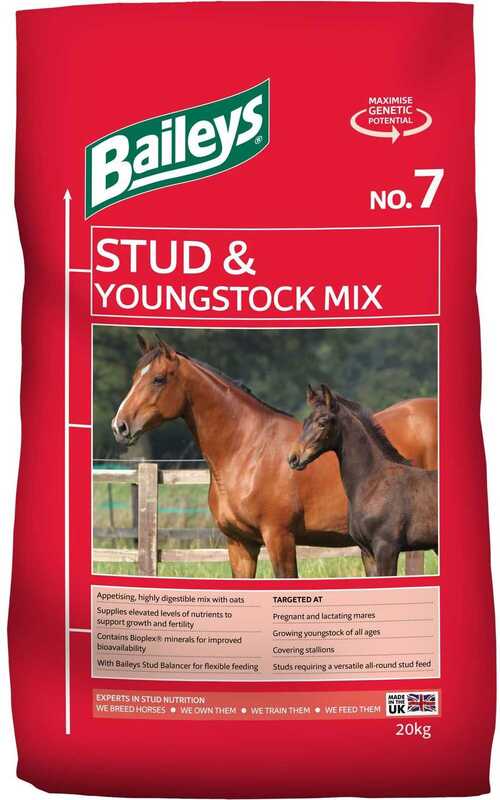 Stud Mix & Youngstock Mix is the ideal all-round stud ration for pregnant and lactating broodmares, growing foals and youngstock as well as covering stallions and can be fed alongside Stud Balancer to add flexibility to the feeding regime. For example, to reduce the overall calorie content of the diet for a better doer, Stud & Youngstock Mix can be fed in reduced quantities and the diet topped up with Stud Balancer to ensure essential nutrient levels are always maintained. The following table suggests quantities of Stud & Youngstock Mix to be fed in pounds and kilogrammes per day when feeding ad lib good quality forage. Quantities are based on the “anticipated mature bodyweight” of the youngster or actual bodyweight of the adult horse. The actual/estimated bodyweights of a youngster’s dam and/or sire are a good basis from which to estimate the “anticipated mature bodyweight” ie. the bodyweight you believe the youngster will attain as an adult.